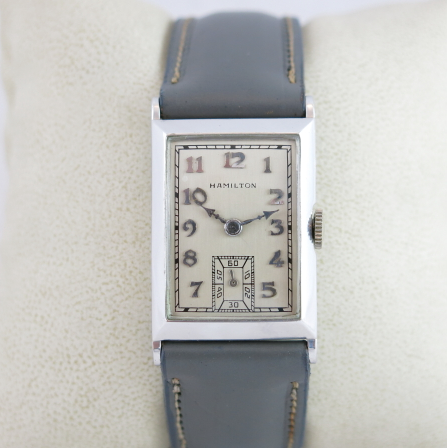 Hamilton introduced a variety of new models in 1930 - many of which are "holy grails" for Hamilton collectors. 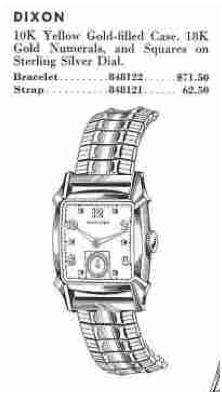 It seemed that the company cut it's wrist watch teeth on the geometrics of the 1920's but really hit it's stride in 1930 and beyond. 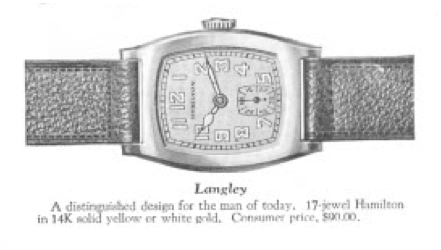 One of the very nice "entry level" solid gold models introduced in 1930 was the Langley. The Langley was produced through 1934. 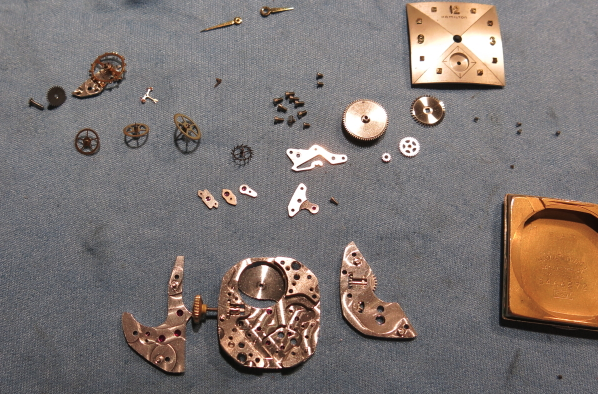 Originally it featured the 987 movement but eventually was marketed with the similarly sized, 19 jewel 979 (or 979F) movement that was used in the other solid gold models. 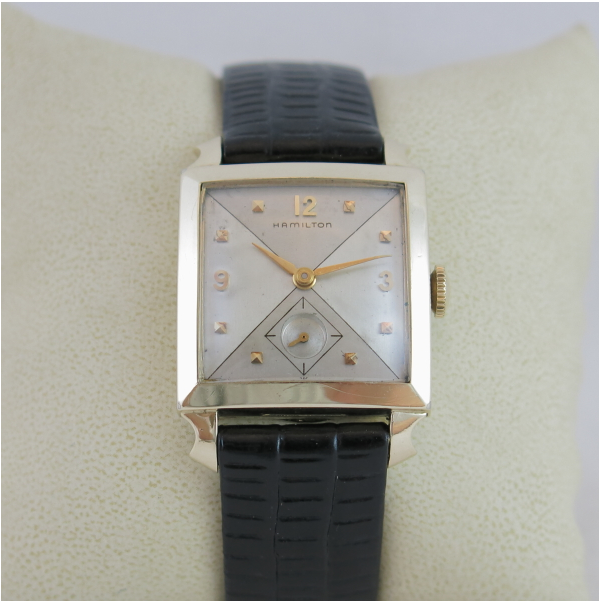 The Langley was produced in 14K yellow gold and 14K white gold. There are about twice as many white versions as yellow versions. 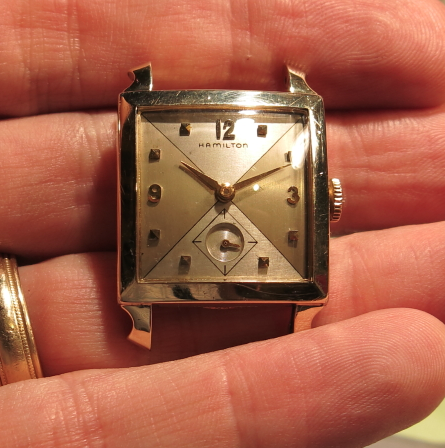 There are even a small handful of 18K Langleys manufactured for Tiffany with Tiffany branded dials. You'll also occasionally find specially engraved "ask the man who owns one" Langleys produced for the Packard Motor Car Company. 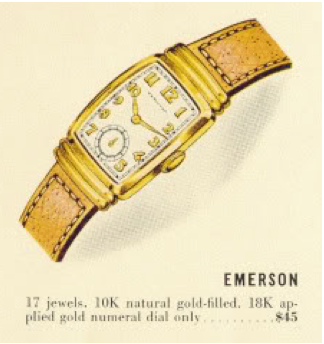 The Langley came with a luminous dial as well as a less common Raised Gold Figure dial with applied solid gold numerals. 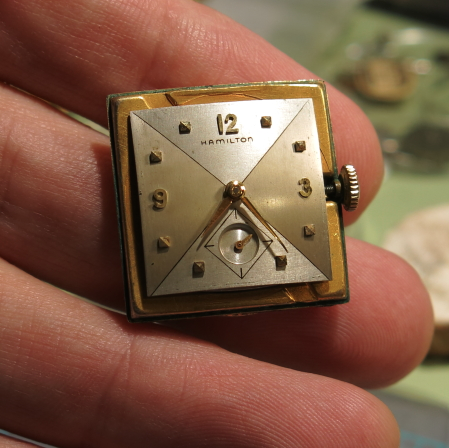 Hamilton would later call this an Applied Gold Numeral dial. The Langley can be found in a three-piece case as well as a two-piece case. 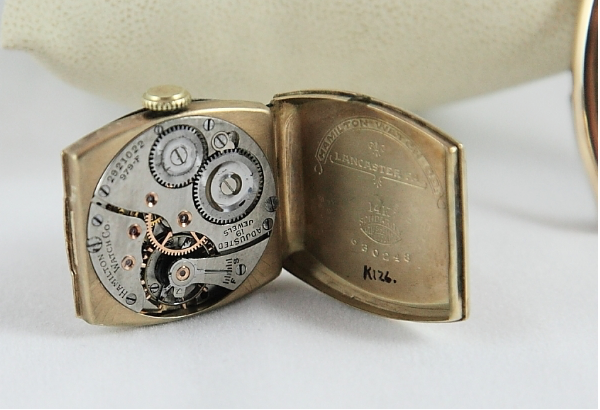 In the three-piece case the movement is held in a center section that hinges into the case back - and the case back snaps into the front bezel. I've had the pleasure of working on a couple of Langleys for other collectors I know. 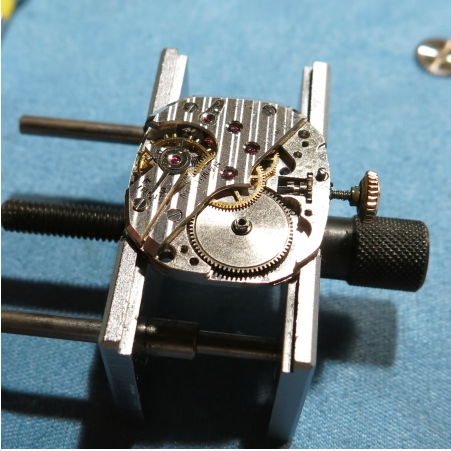 Here's a yellow gold version... notice the female spring bars needed for this type of case. These types of bars are used when the case has pins instead of holes. 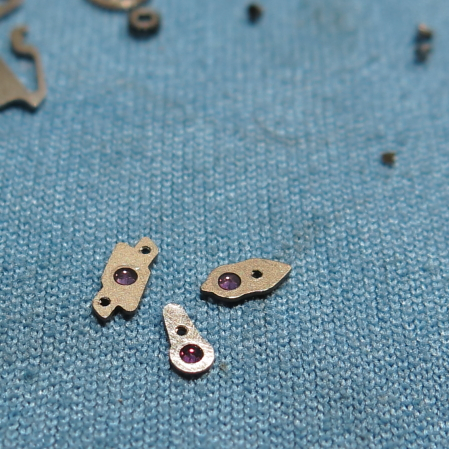 The bars go over the pins rather than sticking into holes in the bezel lugs. 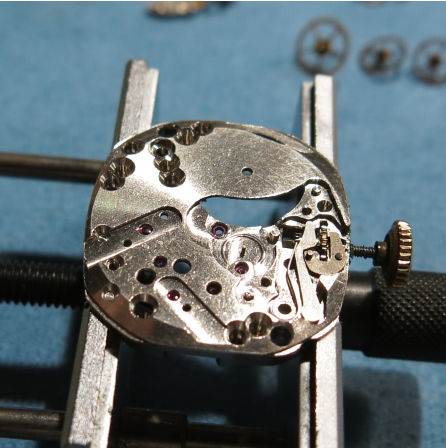 Here's what a three-piece case looks like with the 19 jewel 979 movement inside the center section that is hinged into the case back. And here's a white version of the Langley. 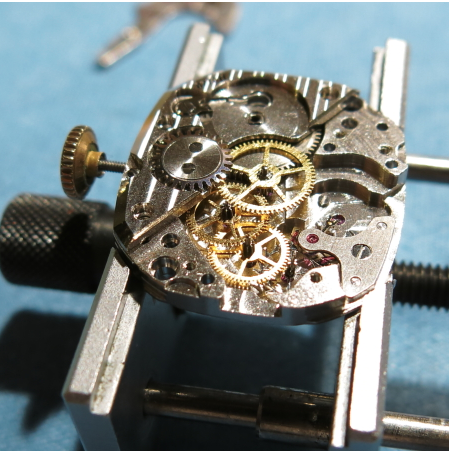 Automatic, or self-winding, watches date back to the early half of the last century. 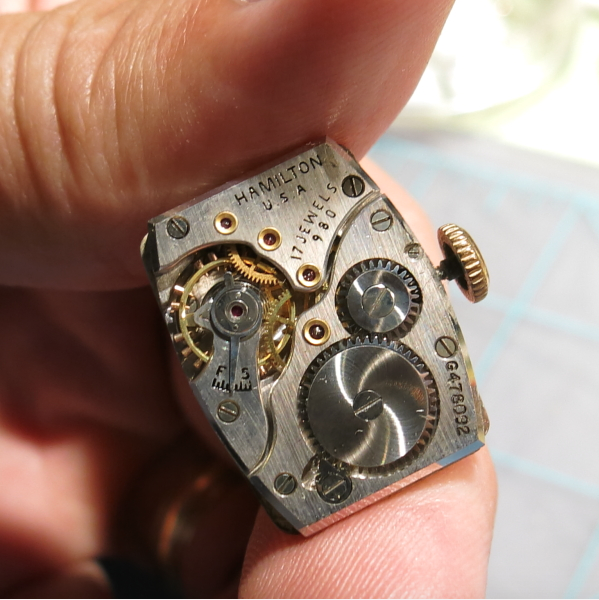 Hamilton was not on the cutting edge of innovation when it came to this type of unique watch movements. In fact, Hamilton didn't offer any automatic models until 1954. 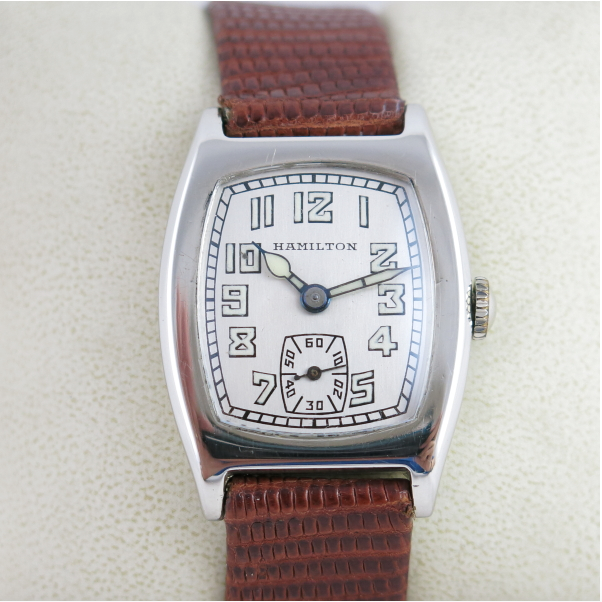 In 1954 Hamilton introduced a dozen new automatic models into the product line, including it's first-ever calendar watch (the K-575). From then on, automatics would grow in significance within Hamiltons offering. 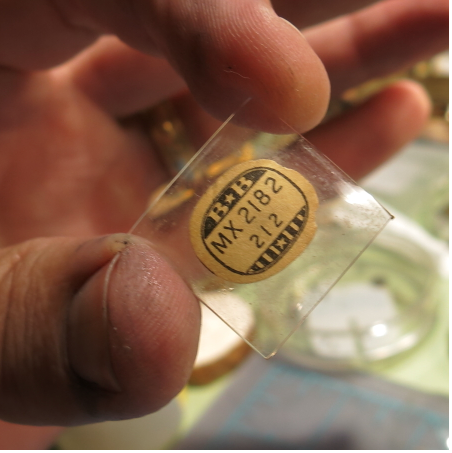 Hamilton also introduced the model nomenclature it would use going forward, where the first number denotes the type of material the bezel is made of... 1xx would be 18K gold, 2xx is 14K gold, 3xx is 10K gold, 4xx gold filled and 5xx is stainless steel. 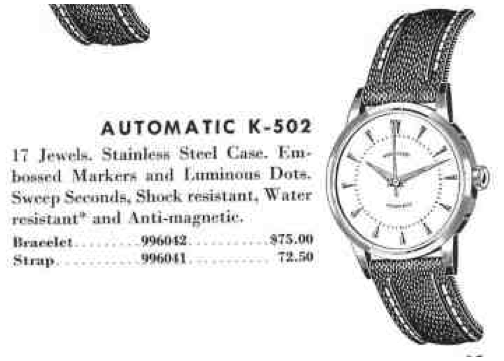 One of the twelve new models was the Automatic K-502. It was produced for only one year. 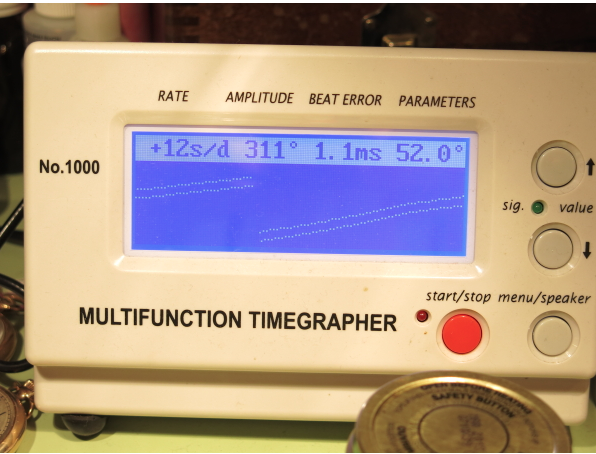 The K-502 is a sturdy watch thanks to the stainless steel case. The embossed dial features luminous dots and the dauphine style hands are also luminous. 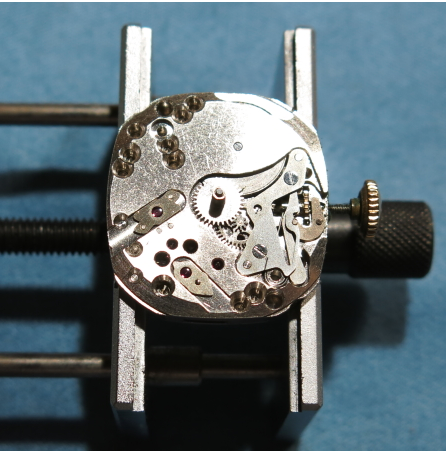 Behind the dial you will probably find Hamilton's 661 movement - but I'm not 100% sure though, as I sold my only example and don't have a movement photo. The 661 is used in most of the early automatics though. 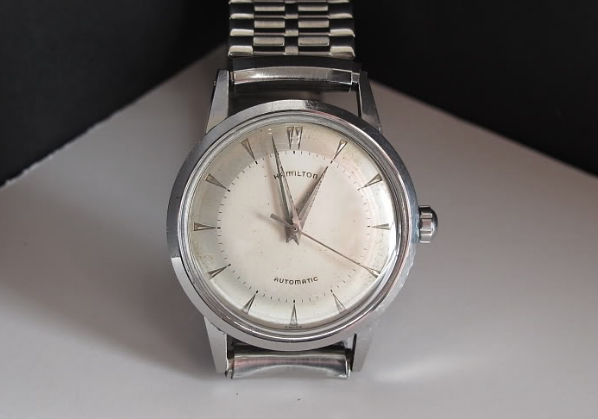 The Automatic K-502 is a nice looking watch, but a little plain in my opinion. I'm sure if it came in a black dialed version it would have been much more popular. 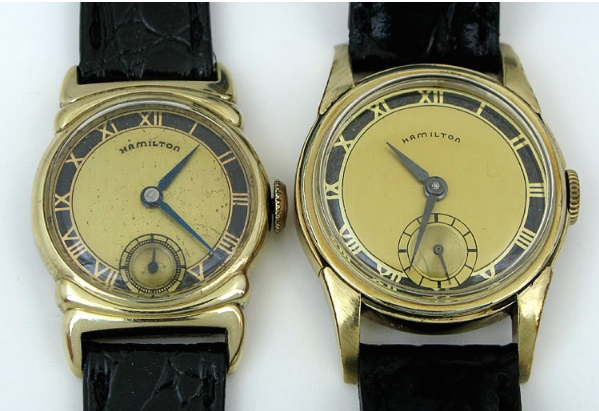 Hamilton has a number of watches with "recycled" model names. In some cases, three different models each share the same name. Normally there's about a 15 year or more span between versions -which at the time probably seemed like a lot. But when looking back over the 50 years that Hamilton made wrist watches in the USA, 15 years doesn't seem so long in hindsight. 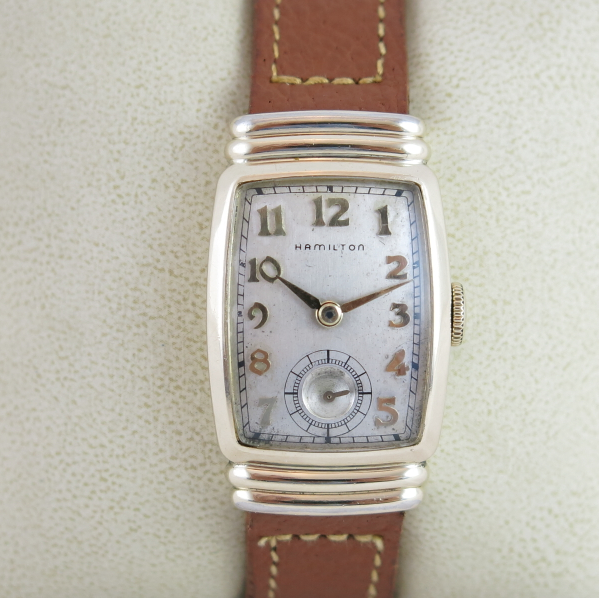 In 1935, Hamilton introduced the original Dixon. 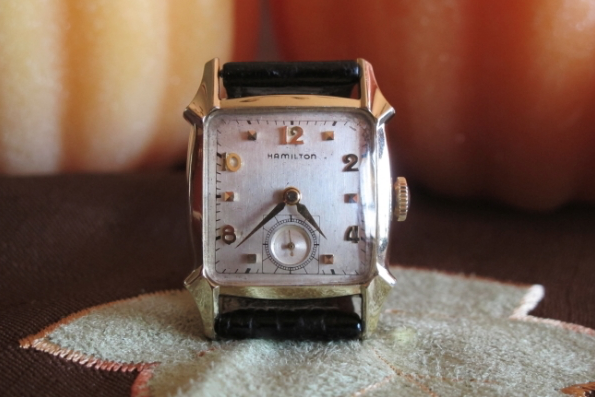 Then, in 1953 Hamilton reintroduced the model name with an entirely different design. The "new" Dixon was made for three years. The Dixon came in a 10K gold filled case. 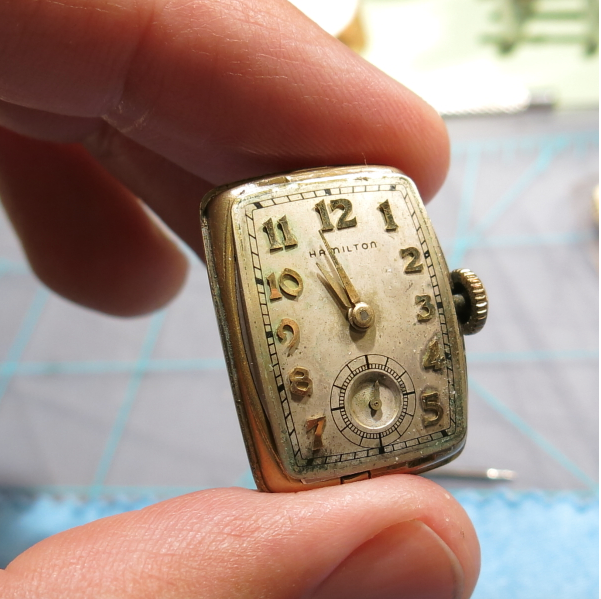 The sterling silver butler-finished dial features 18K solid gold numerals and markers. 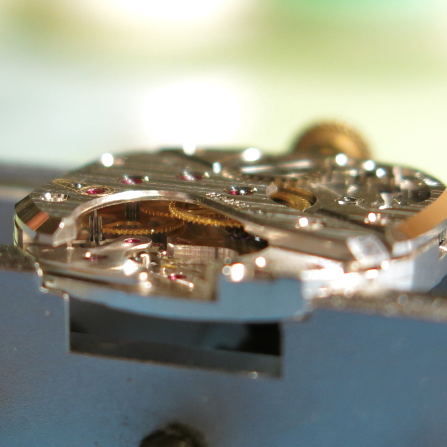 Behind the dial is an 8/0 sized 17 jewel 747 movement. The Dixon is a great example of 1950's styling, when cases became very sculpted and featured a variety of angles and sharp details. It reminds me of some of the cars from the 1950's that featured the same sort of styling... big fins, and all. 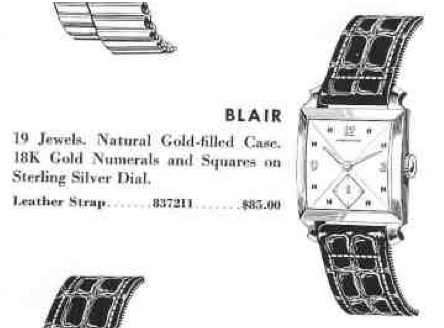 These watches often came with bracelets that celebrated the same angular details featured in the bezel. Below is a picture of a Dixon I used to have. If you look closely at it you might realize that something isn't quite right... can you see it? The hour markers are different than the catalog ad! 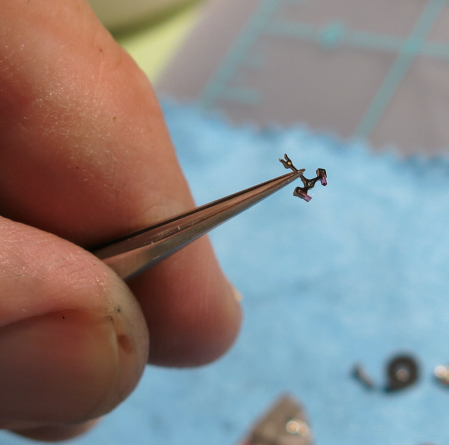 Is this watch a "franken"? If so, that's a big deal as having the correct dial is important. You might have also noticed the second hand is a different style. That's usually not a big deal though, it's nice to have the correct style but it's also very easy to change. 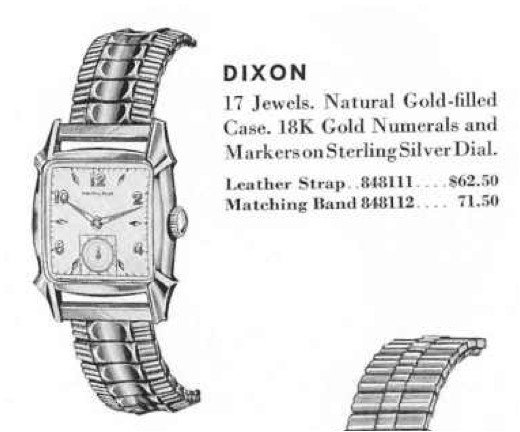 Turns out, in 1955 Hamilton changed the Dixon to feature "gold numerals and squares". So this Dixon is 100% correct - it's just a 1955 example. Identifying these little unique style changes is part of what makes collecting Hamiltons an exciting challenge. 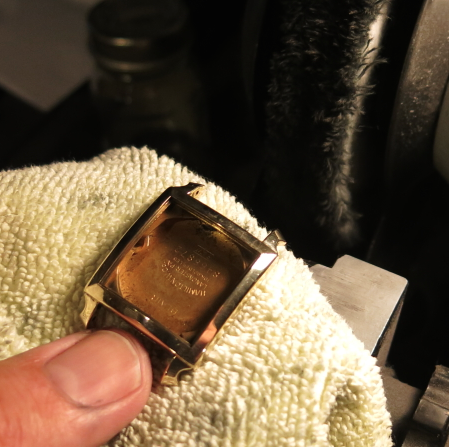 Just like swimming pools and boats, sometimes it's nice to have friends when it comes to watches. A friend of mine recently asked me to check out a new acquisition he made... a Rutledge! 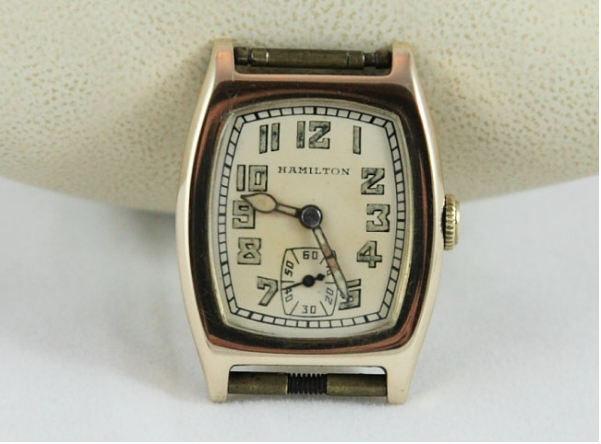 Hamilton made watches in all sorts of materials ranging from stainless steel to silver, from gold plated to solid 18K gold, and in some rare circumstances - even platinum! 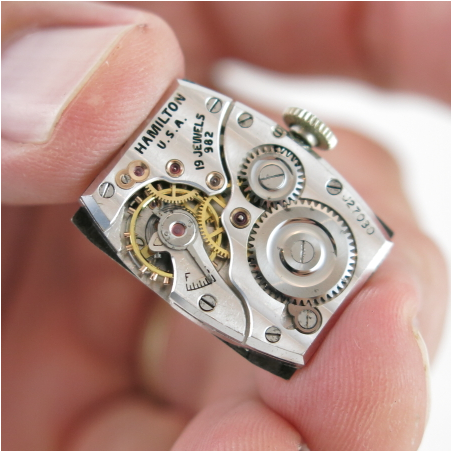 I would be willing to bet that most of the time you see a platinum-cased Hamilton watch it's a "franken" - or a Hamilton movement in a private jewelers case. 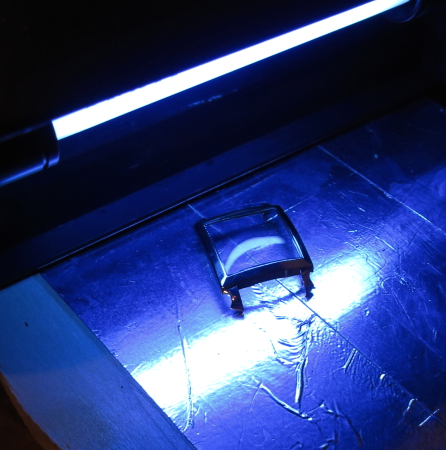 However, there are a small handful of legitimate platinum models. One of which is the Rutledge. The Rutledge was introduced in 1935. 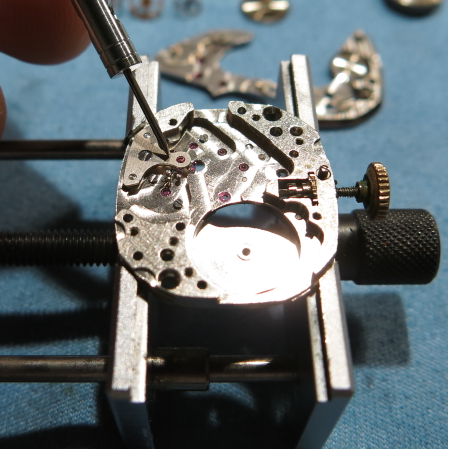 It's not the first platinum model, there were earlier models like the Oval where a tiny number of watches were cased in platinum. 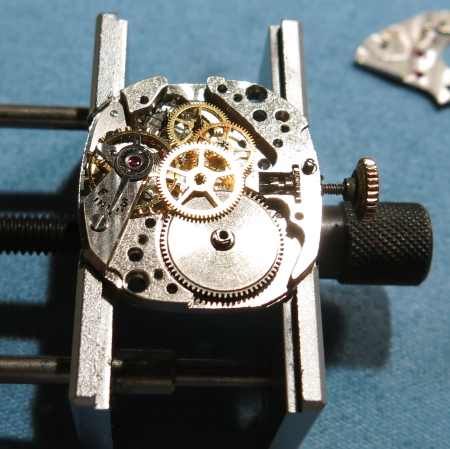 But I do believe the Rutledge was the first catalogued model to be only available in Platinum. 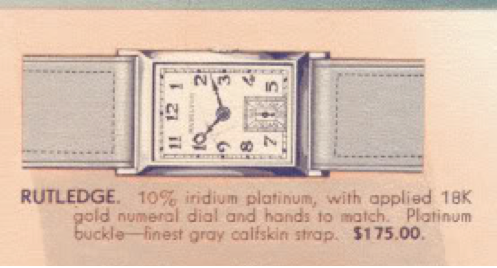 Considering the model was released in the depths of the Great Depression, this was not an inexpensive watch. It was about twice the cost of other solid gold models. 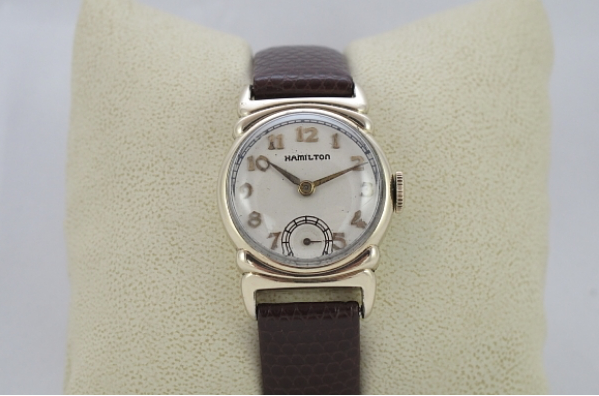 One little bit of trivia is the Rutledge originally came with a platinum buckle to match but as the Depression wore on, Hamilton changed the buckle to white gold and offered platinum as an option for added cost. The Rutledge continued to be offered through 1951, when a new platinum model called the Cambridge was introduced and produced through 1953. 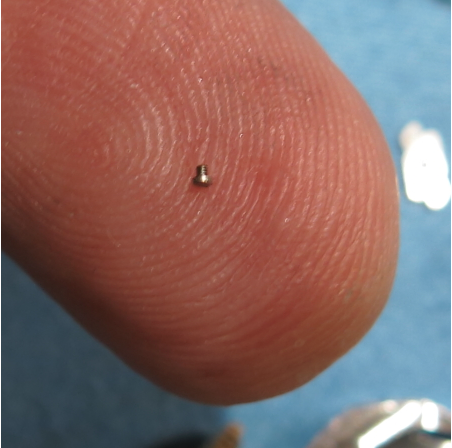 The case of the Rutledge is alloyed with iridium to give it additional hardness. The silver dial has rhodium plated solid 18 gold numerals with matching hands in the "spear" style. As I said above, a friend of mine recently purchased a Rutledge and he asked me to check it out for him. 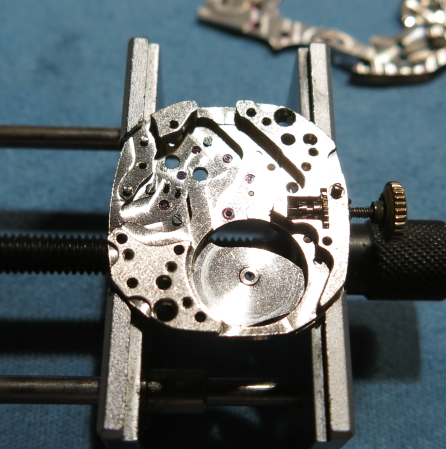 As received, it came presented on an expansion bracelet - which would not be correct for a watch of this caliber. It turns out, one of the most challenging things of a Rutledge is to locate a 19mm (or 3/4") strap in gray... try doing that sometime! Of course, the second most challenging thing is to get female spring bars to accommodate the strap - as this case has little pins in the lugs as opposed to holes to receive the spring bar. The spring bars are actually open tubes on the end and they are very hard to locate in a big enough size. 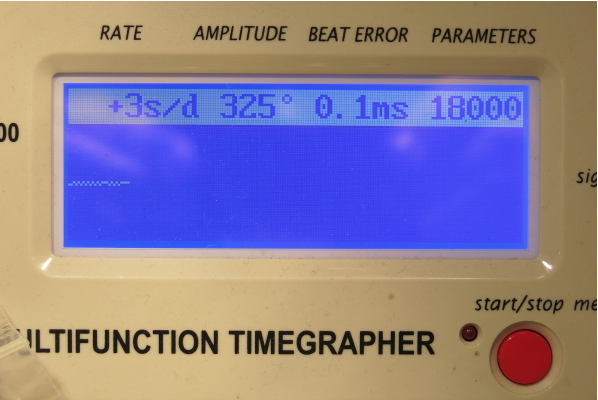 As you can see, this watch is in fantastic shape. 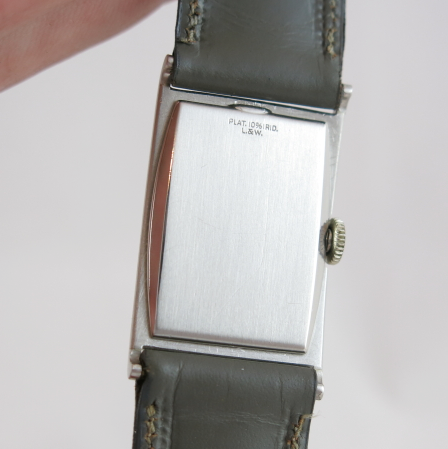 It even still featured the brush marks on the case back that you rarely see with previously worn watches. 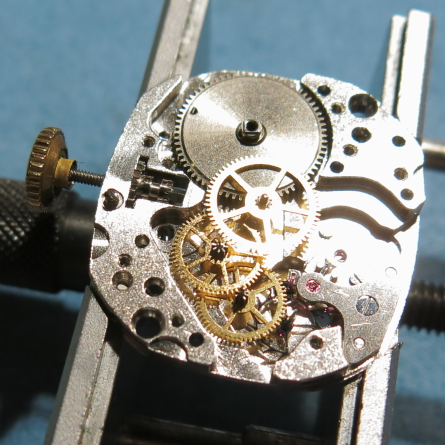 The Rutledge, like all precious metal-cased Hamiltons with a 14/0 movement got the 19 jewel 982 until 1940 and after that was outfitted with the 982M medallion movement. 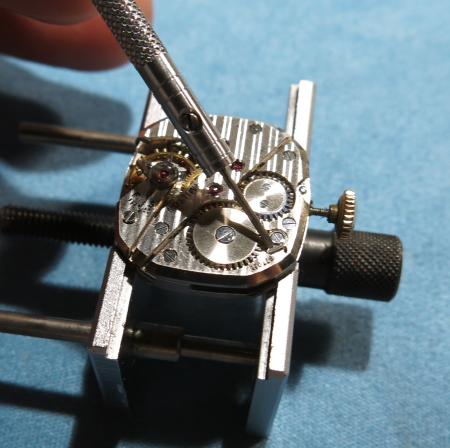 This movement needed a little tweaking to the regulator to slow it down a smidge but otherwise it looks and runs clean. 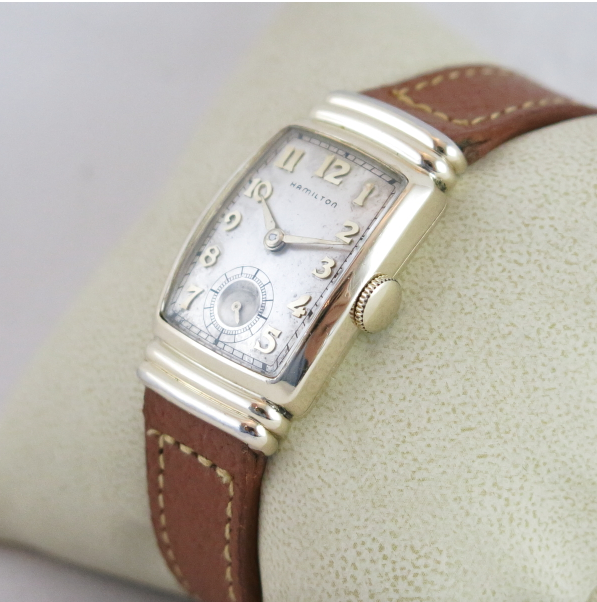 Based on the serial number, this watch is a 1937 model. It was a real treat to see this watch as I'm not likely to lay hands on another one anytime soon. But that's okay - once is enough. Continuing my posts on micro-men's models, another enticing model for the unsuspecting collector is the 1940 Paige. 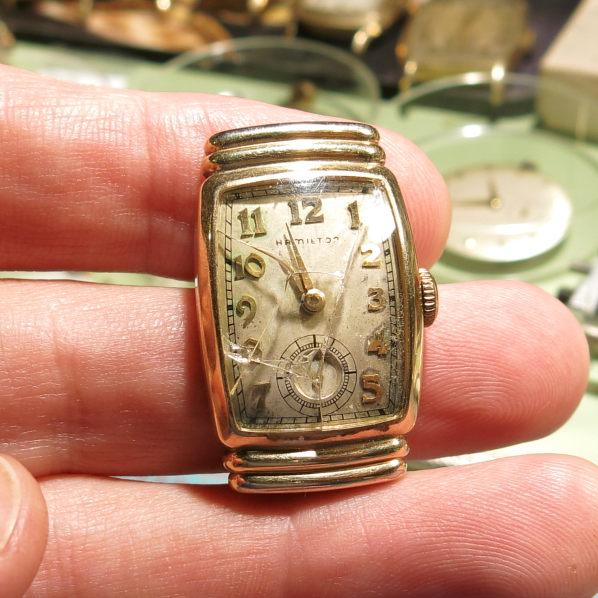 This very stylish model is quite attractive but it's dial is no larger than a nickel. 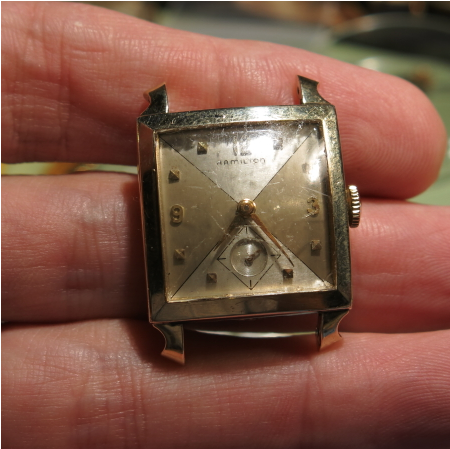 The Paige came in a 14K gold filled case with a choice of an AGN dial or a black zone gilt dial. The latter is very similar to the Endicott, which was also available at the same time. The Paige was only produced for two years. 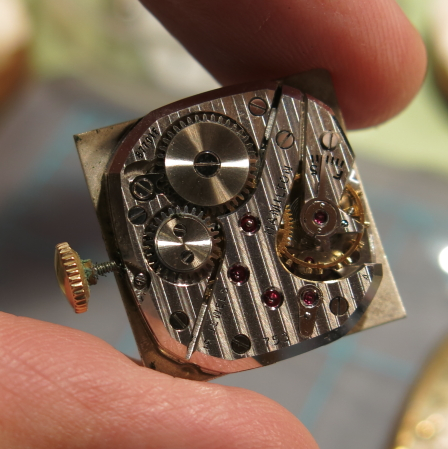 Under the dial is a 19 jewel, 14/0 sized 982 movement and it pretty much fills the tiny case that comprises the model. Here's a photo of a Paige I restored a while back. The domed crystal gives the dial a bit of a gold fish bowl effect. 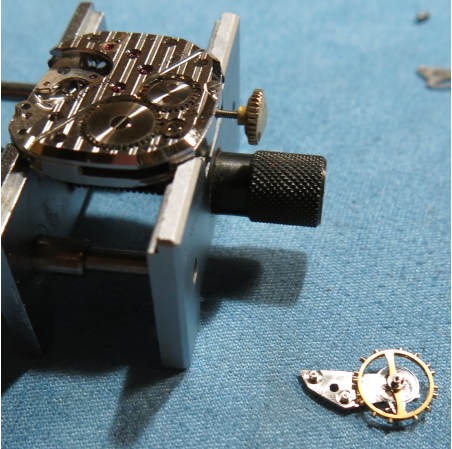 And here's an example of the black zone dialed version alongside an Endicott with the same style dial. The photo is courtesy of fellow-collector, Tom Diss. 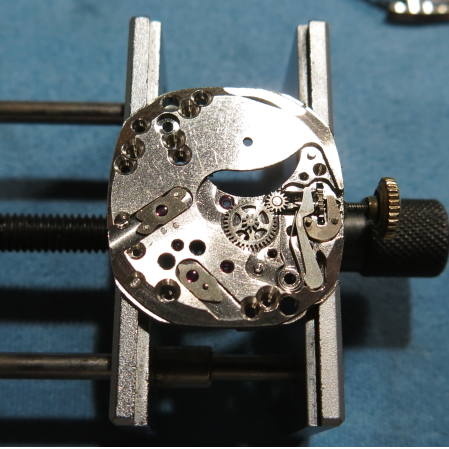 Keep in mind the Endicott has a 6/0 sized movement and is about 28mm wide. So you can imagine just how much smaller a Paige is when on the wrist. 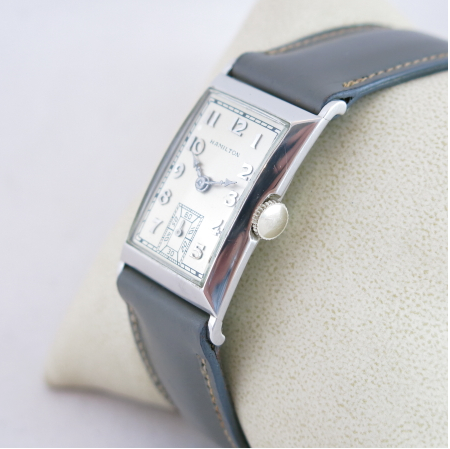 Still, the Paige is an attractive model in my opinion and would be a great gift option for a special lady who appreciates vintage time pieces.